Against the backdrop of social and political reform of the early 1900s, Nancy Cooper Russell was a woman ahead of her time. A self taught business woman with the ability to take charge, Nancy helped Charles M. Russell become the highest paid living artist of his time. 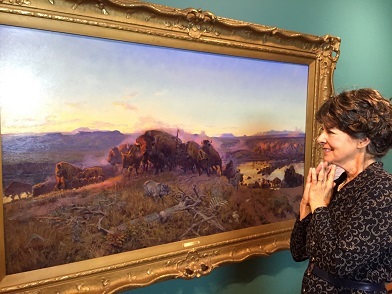 Art historians consistently give her credit for being the reason the world has the extraordinary Russell paintings and sculptures that grace gallery and private collections today. Who was this remarkable woman behind the man? 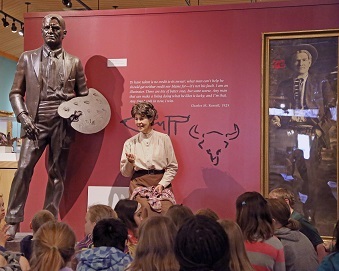 Nancy shares the story of her chance meeting with the Montana cowboy artist who would become her husband, about the world of art that celebrated the myth of the west at the beginning of the 20th century, about the renowned artists and celebrities the Russells knew as they traveled from NYC to the growing California suburb called Hollywood. This is a 45 minute - 1 hour program with time for questions and discussion. "My wife has been an inspiration to me in my work. Without her I would probably have never attempted to soar or reach any height, further than to make a few pictures for my friends and old acquaintances . . . I still love and long for the old west, but I would sacrifice it all for Mrs. Russell." "I married the only Charlie Russell in the world, and my life has been full of romance, which they like to make movies out of, only mine happens to be real."